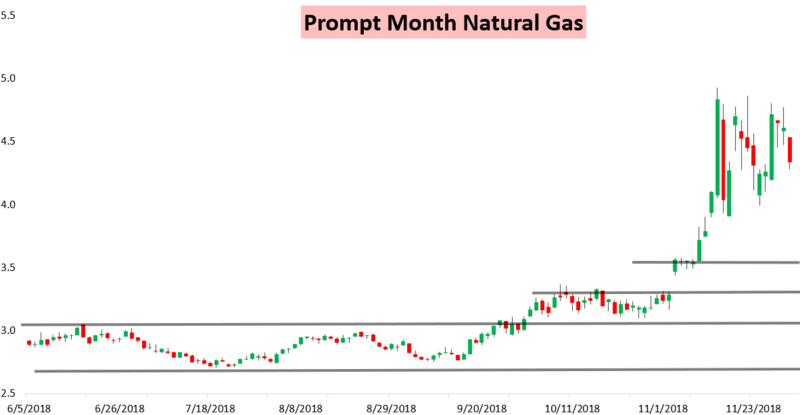 It was a bloodbath at the front of the natural gas curve today, as after a decent gap down last evening the January contract accelerated lower through the day. A bounce into the settle helped prices close decently off the lows, but the January contract still settled 6% below Friday's close. 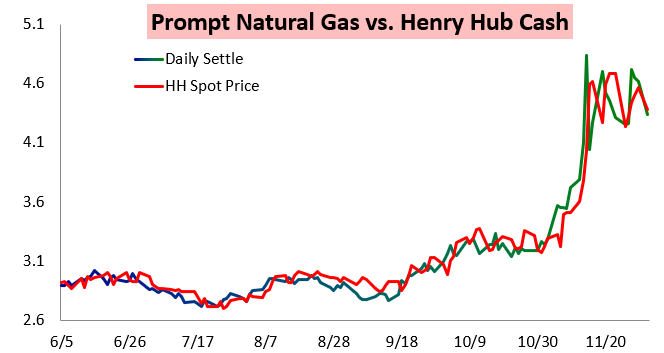 All the losses came at the front of the natural gas strip, as the from April 2019 and beyond prices actually caught a bit today. 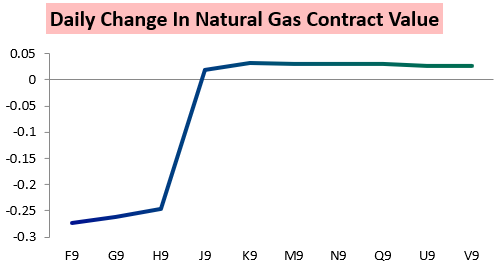 The role of weather was clear with the January contract logging the biggest loss as well. 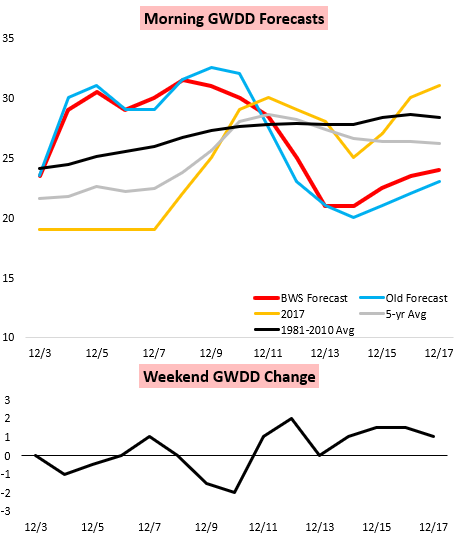 Over the weekend we saw long-range warm risks roll forward into the medium-range, as we noted in our Morning Update that Week 2 warmth would likely cancel out Week 1 cold. This fit very well with our expectations, as the overall 15-day forecast did not change much from our Friday outlook for clients either. In our Pre-Close Update we warned clients that we expected bearish weather trends over the weekend as long-range warmth would roll forward. In that same Pre-Close Update we warned of prices likely moving back below $4.5 this week, something that quickly occurred last evening. 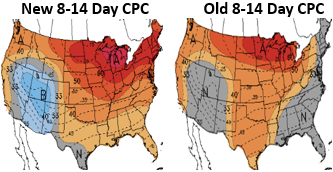 The focus today was all about that long-range warmth, with Climate Prediction Center forecasts increasing coverage of expected above average temperatures in Week 2. Meanwhile, we did see cash prices remain a bit more firm today with cold expected across the country this week. All eyes will be on the cash market tomorrow too with significant cold expected Wednesday, and that is something we broke down in our Afternoon Update for clients.
. We also released our Natural Gas Weekly Update today, our flagship report diving into all aspects of the current weather forecast and natural gas market. 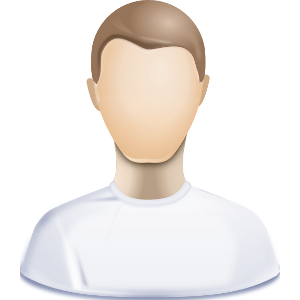 To give all our research a look and see how we can help you manage risk in the natural gas market, try out a 10-day free trial here.